In celebration of its 110th anniversary, Montblanc introduced few new models – one with a new caliber – in its 4810 collection. The revamped collection is designed to reflect the era of adventurous sea travel at the turn of the century, around the time Montblanc was founded (in 1910). The 4810 collection is a reference to the 4,810-meter height of Mont Blanc, the highest mountain in Europe, for which the company was named, and is thus iconic to the brand. The star of the new 4810 lineup is the ExoTourbillon Slim, with a new caliber, the MB 29.21, a tourbillon with a stop-seconds function for precise setting. 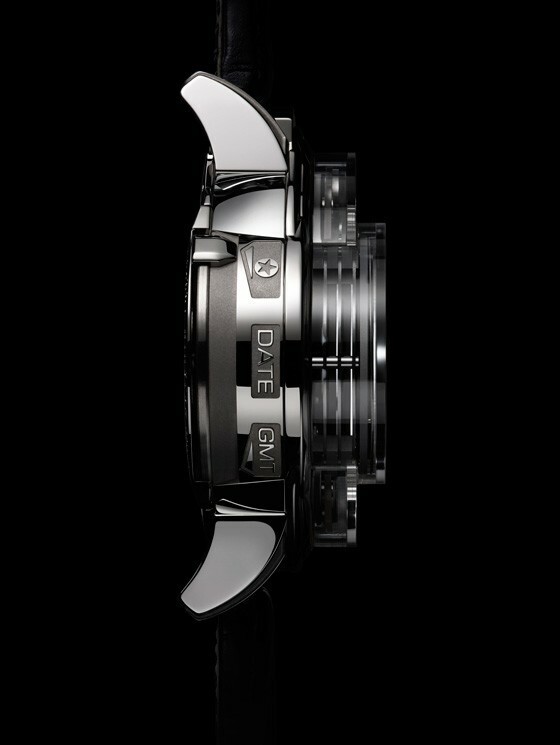 The movement is ultra-slim, measuring only 4.5 mm thick and the cased watch only 10.14 mm thick. According to Montblanc, two things make this a high-performance tourbillon: a lightweight cage that results in higher precision and improved isochronism; and a large (9.7 mm), 18-screw balance wheel, adjustable in four positions. 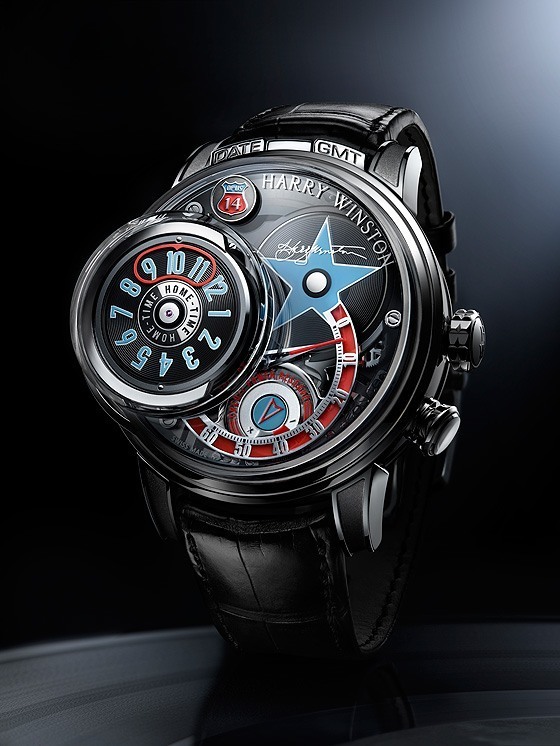 The balance sits outside and above the tourbillon cage, where it can be seen to stop oscillating when the watch is being set – the red seconds indicator on the cage also stops when the watch is being set. There are also three special editions of the 4810 ExoTourbillon Slim with miniature hand-painted maps of North America, Asia and Europe. It takes one week to produce each dial in this limited edition of 110 pieces each. 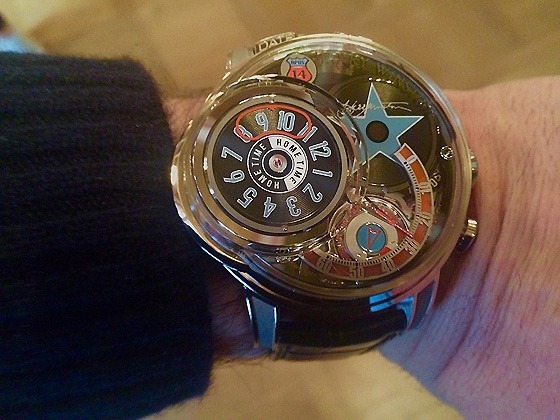 They contain Caliber MB29.24 – also with a stop-seconds function but no micro-rotor – priced at $43,400. The new 4810 lineup also includes a new Day-Date with Caliber 24.02, a Chronograph Automatic with Caliber MB 25.07, and a Twin Fly Chrono with Caliber MB LL100.1. All of the new models meet the standards of Montblanc’s Laboratory Test 500, simulating real-life wear for over 500 hours. Swiss watch brand Tudor began its partnership with Italian motorcycle maker Ducati in 2011, and introduced its first Fastrider Black Shield watch — directly inspired by the Ducati Diavel — in 2013. With this year’s release of the new Ducati XDiavel cruiser model, Tudor once again brings out a Fastrider Black Shield using the design language of the new superbike. The matte black dial is punctuated by white hour markers and numerals, a white central chronograph hand, and small white hands for the chronograph subdials and small seconds subdial. A white luminescent coating is used on the hands and hour markers. The monobloc case, made of high-tech black ceramic, is water-resistant to 150 meters and virtually scratch-proof. The deliberately sculpted, angular contours of the case (which measures 42 mm in diameter and has a sleek, bead-blasted finish) are meant to evoke the streamlined bodywork of the Ducati XDiavel. The fixed, matte-black ceramic bezel is engraved with a tachymeter scale, a useful feature for motorbike racing enthusiasts. The dial’s tricompax arrangement has chronograph subdials at 3 o’clock (30 minutes) and 6 o’clock (12 hours) and a small seconds subdial at 9 o’clock. The screw-down winding crown — which is inscribed with the Tudor logo — and chronograph pushers are in black PVD-treated steel that seamlessly matches the dark hue of the ceramic case. The movement in the new Tudor Fastrider Black Shield is the automatic chronograph Caliber TUDOR 7753 (based on the tried-and-true ETA Valjoux 7753), which has a power reserve of approximately 46 -hours and a fast-adjustment date corrector; the date display appears on the dial in an aperture at 4:30. The matte-black calfskin leather strap, with white contrast stitching, continues the “stealth” theme of the dial and case. The watch is also available with a matching matte-black rubber strap. Anyone interested in procuring the 2015 edition of the Tudor Fastrider Black Shield can start revving up their engines now for a trip to their Tudor authorized retailer: it’s on sale now, released to coincide with the launch of the Ducati XDiavel on November 16. 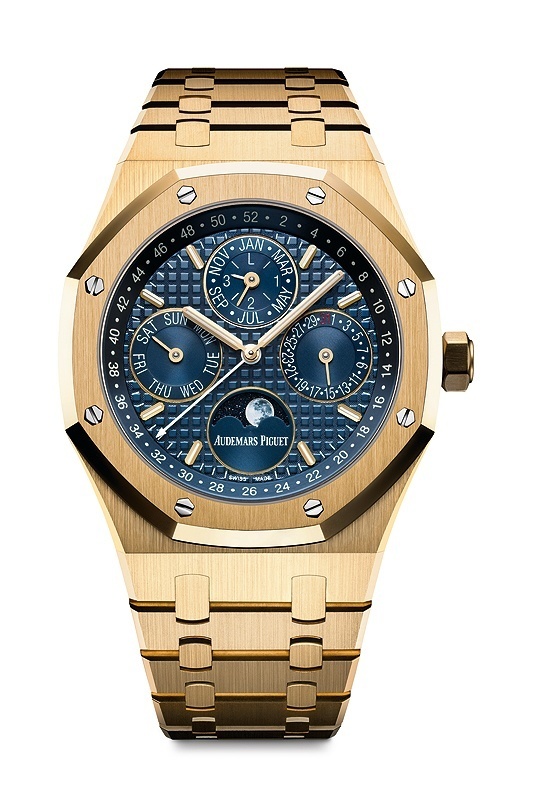 It’s priced at $4,925 on both the rubber and leather strap. 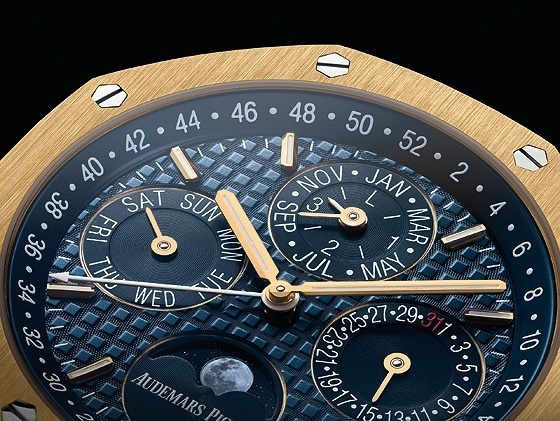 Audemars Piguet released a new version of its Royal Oak Perpetual Calendar in classical yellow gold. 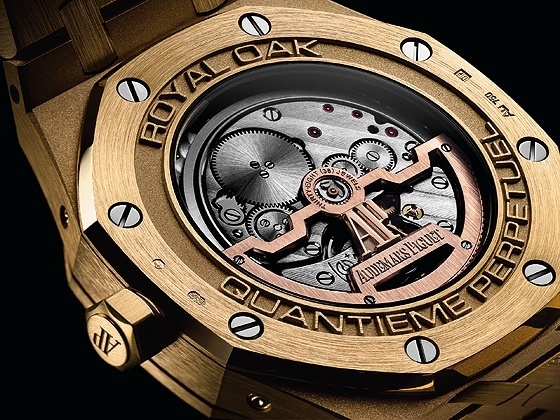 Like the most recent models of the Royal Oak Perpetual Calendar, in steel and rose gold, this watch has a 41-mm case in the classical octagonal style of the Royal Oak collection and featuring a clear, glare proof sapphire case back. It has a screw-locked crown, ensuring water-resistance of 20 meters. The au courant blue dial is decorated with the collection’s familiar “Grande Tapisserie” pattern of subtly raised three-dimensional squares. The calendar displays are on prominent subdials at 9 o’clock (day), 12 o’clock (month and leap-year), and 3 o’clock (date). In addition, an astronomical moon-phase display appears at 6 o’clock and the week of the year is indicated on a numbered 1-52 chapter ring surrounding the dial. The applied hour markers, like the case, are in yellow gold and the hands are treated with luminous coating. 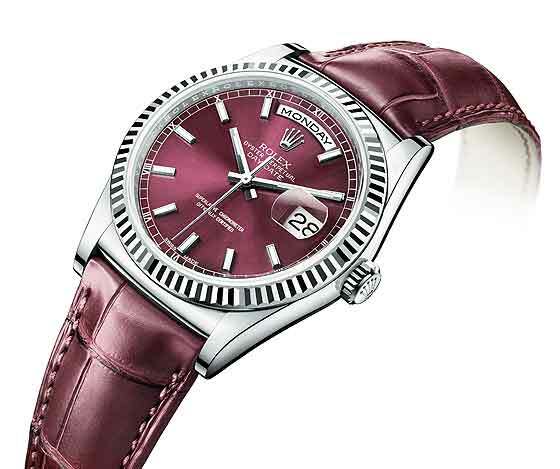 Rolex have released the new Day-Date 40, a larger version of the classic 36-mm Day-Date with an all-new movement. Fans of the original Day-Date still have plenty of options at the more modest size, including the five recently launched models: 18k yellow gold, 18k white gold, or 18k Everose gold cases and available in several colourful dial-strap combos. These Rolex Day-Dates are powered by Rolex’s manufacture Caliber 3155, an automatic movement and certified COSC chronometer. 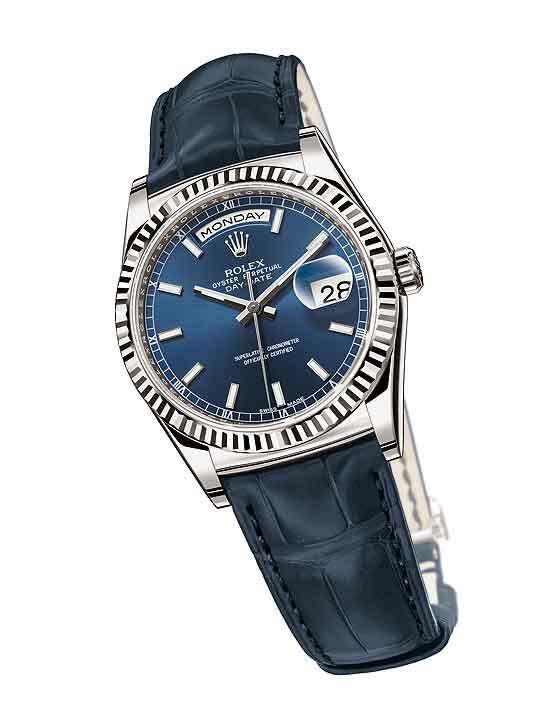 The blue Parachrom hairspring (Parachrom is another Rolex-exclusive alloy) in the movement’s oscillator is built to resist the influence of magnetic fields and withstand extreme temperature variations. According to Rolex, this type of hairspring is also 10 times more shock-resistant than the traditional type. Among the movement’s other attributes are a large balance wheel with variable inertia, a Breguet overcoil, a stop-seconds function for precise time-setting, and a power reserve of around 48 hours. 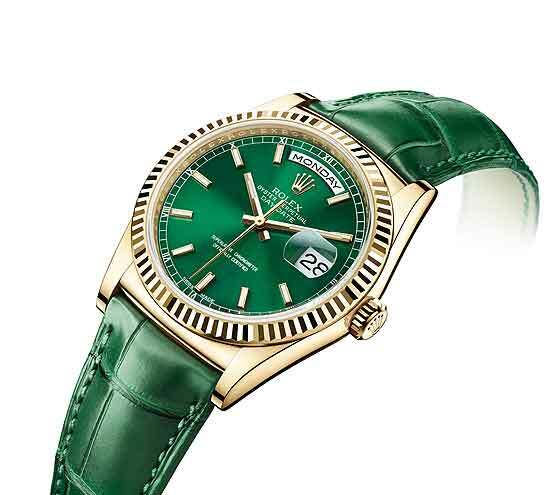 Prices on the five Rolex Day-Dates range from $23,000 to $25,000. The new Bentley GT3 is inspired by the Continental GT3 racing car. It has a 49mm black titanium case which has a rotating notched bezel housing a self-winding COSC-certified chronometer calibre. 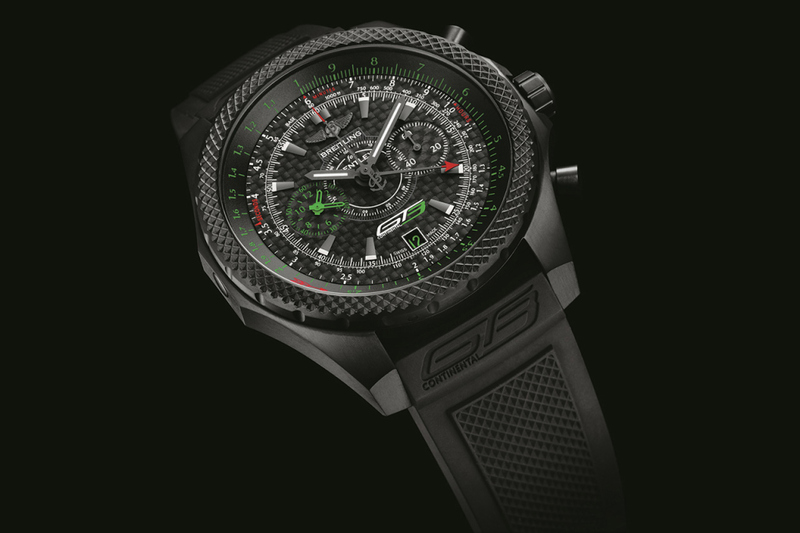 The black carbon fibre dial is reminiscent of the car’s dashboard. The hours and minutes appear in the centre as do the chronograph seconds and minutes (up to 1 hour). The hours and minutes (exceeding 1 hour) glow green in a counter at 9 o’ clock. The green date appears at 6 and the seconds tick by at 3 o’ clock.